Which U.S. metro areas are most targeted? 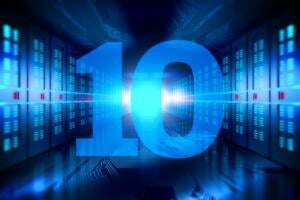 Where does botnet traffic come from? Which countries are most targeted? Every day, the security team at network services provider Level 3 Communications monitors approximately 1.3 billion security events; mitigates roughly 22 distributed denial of service (DDoS) attacks; and removes, on average, one control and command (C2) server network. 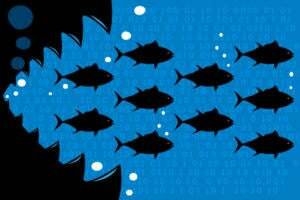 In its new botnet research report, “Safeguarding the Internet,” Level 3 uses its own threat intelligence, combined with other data feeds, to define trends in botnet behavior, DDoS attacks and malware. Read on for some highlights. 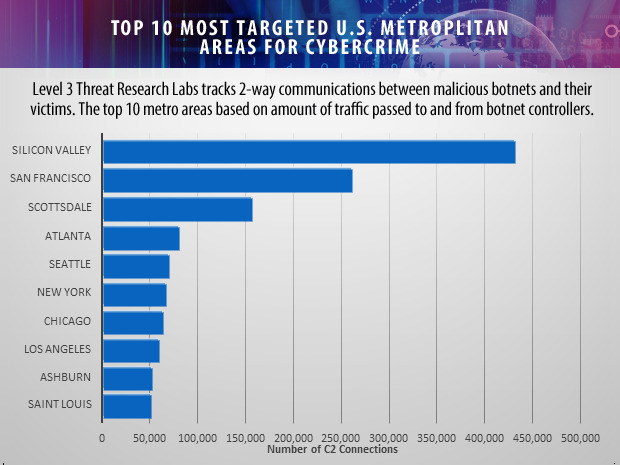 Silicon Valley tops the list of the 10 most targeted U.S. metro areas, according to Level 3’s analysis of traffic sent by malicious control and command (C2) servers. Based on the amount of traffic passed between malicious botnets and their victims, San Francisco is the next most popular target, followed by: Scottsdale, Atlanta, Seattle, New York, Chicago, Los Angeles, Ashburn (part of the Washington, D.C. metro area), and St. Louis. 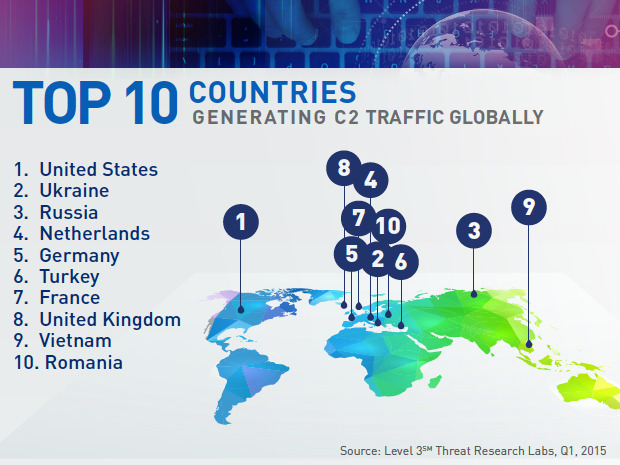 The U.S. generated the most C2 traffic in the first quarter of this year (20% of malicious C2s were based in North America), followed by Ukraine, Russia, Netherlands, and Germany. Norway received the most victim traffic across the globe in the first quarter of 2015, followed by: United States, Spain, Sweden, Turkey, Ukraine, China, Pakistan, Poland, and Egypt. The hardest hit countries – ranked by the absolute number of victims/unique IP addresses conversing with C2s – during the quarter were: China (532,000 unique-victim IP addresses), U.S. (528,000), Norway (213,000), Spain (129,000), and Ukraine (124,000). Level 3 found that the average number of infected hosts per control and command (C2) server is 1,700. 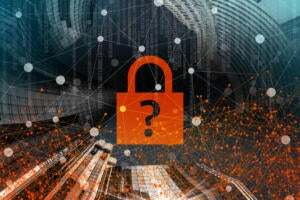 The firm also reports that 22% of C2 servers perform more than one function, such as malware distribution, DDoS attacking and phishing services. During Q1, the average age of a C2 was 38 days. From the report: “According to our research, the average number of infected hosts per C2 is 1,700. Over the course of the year, we track 600 to 1,000 C2s, which control millions of infected hosts. 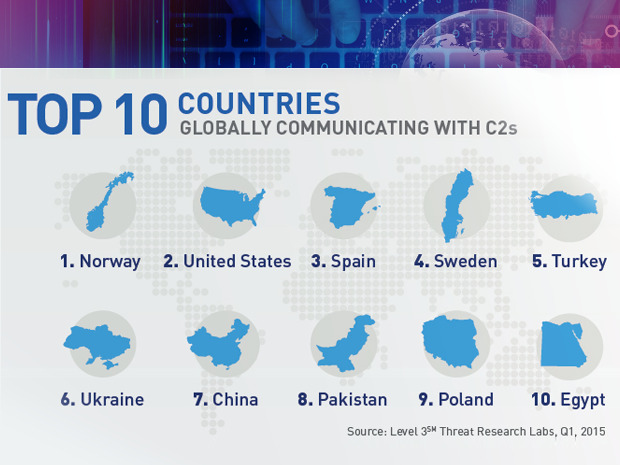 The high volume of measureable communications between C2s and their victims suggest there is opportunity for the security community to collaborate and aggressively reduce the number of C2s on the Internet." 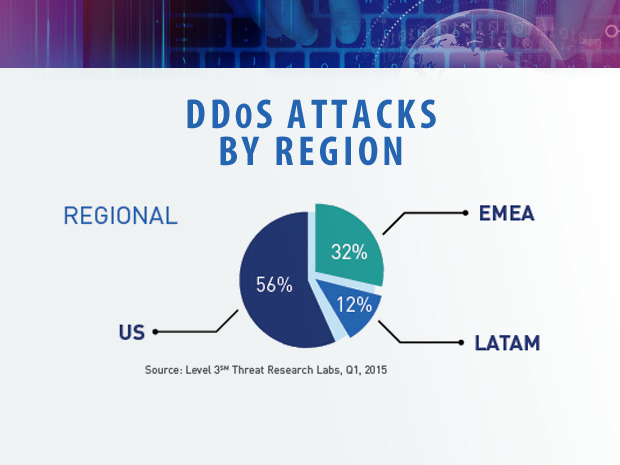 The majority (56%) of DDoS attacks are aimed at targets in the U.S., Level 3 says. 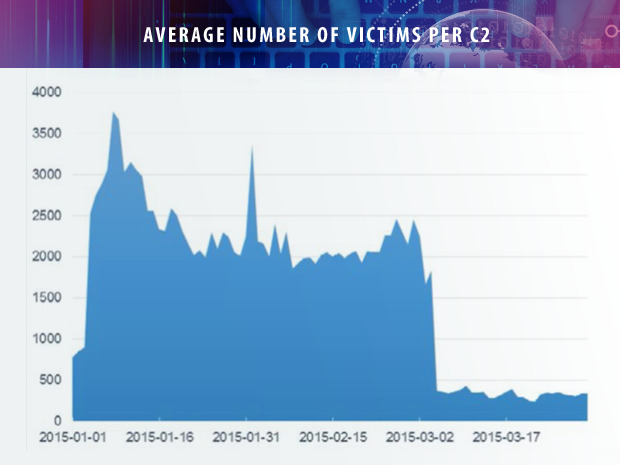 DDoS attacks in Europe are trending up, the firm says. 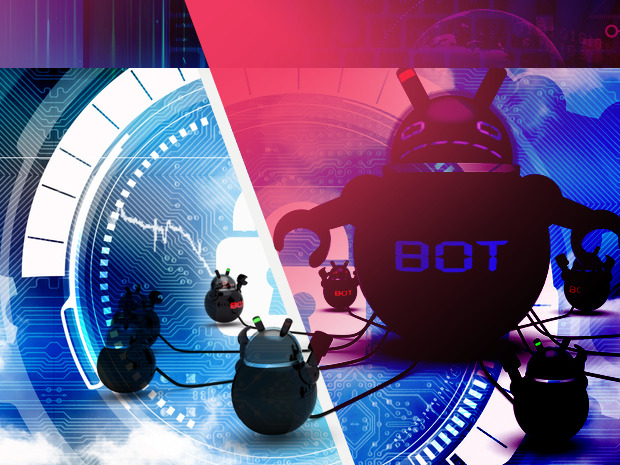 Looking at DDoS attacks by industry, the biggest target in the first quarter of 2015 was the gaming industry, followed by: Internet service providers, Web hosting companies, research and education firms, and the financial industry. 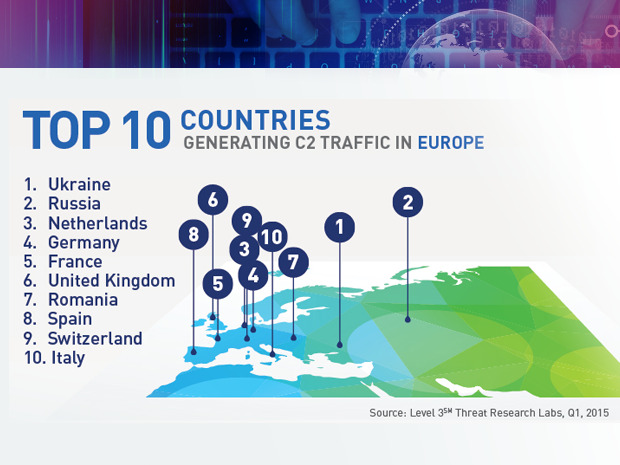 Among the countries in Europe, Ukraine generated the most C2 traffic in the first quarter of the year, followed by: Russia, Netherlands, Germany, France, UK, Romania, Spain, Switzerland, and Italy. On the victim side, the No. 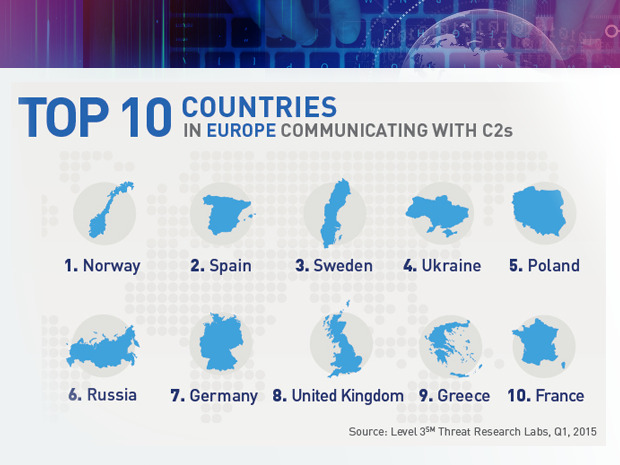 1 targeted country in Europe was Norway, followed by: Spain, Sweden, Ukraine, Poland, Russia, Germany, UK, Greece, and France. 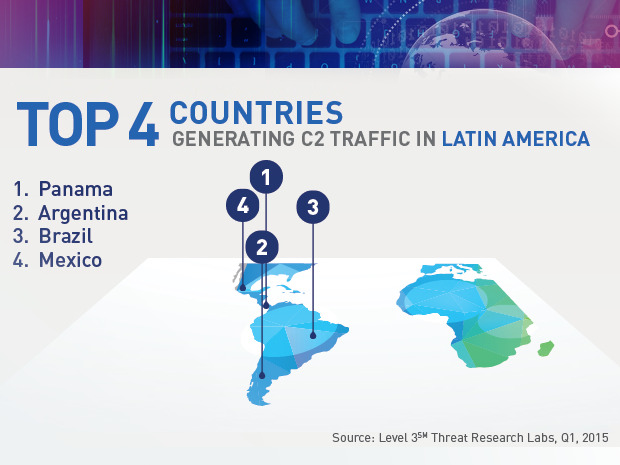 Among the countries in Latin America, Panama generated the most C2 traffic in the first quarter of the year, followed by Argentina, Brazil, and Mexico. On the victim side, the No. 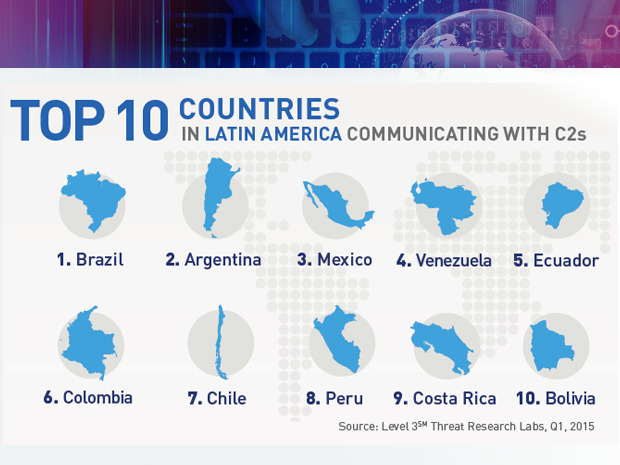 1 targeted country in Latin America was Brazil, followed by: Argentina, Mexico, Venezuela, Ecuador, Columbia, Chile, Peru, Costa Rica, and Bolivia. The No. 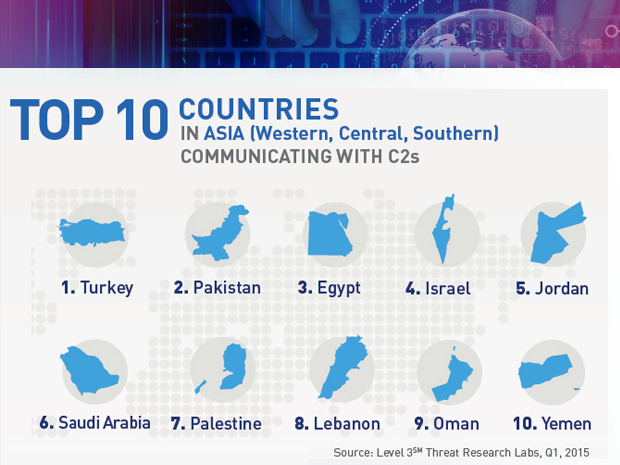 1 targeted country in Western/Central/Southern Asia was Turkey, followed by: Pakistan, Egypt, Israel, Jordan, Saudi Arabia, Palestine, Lebanon, Oman, and Yemen. The No. 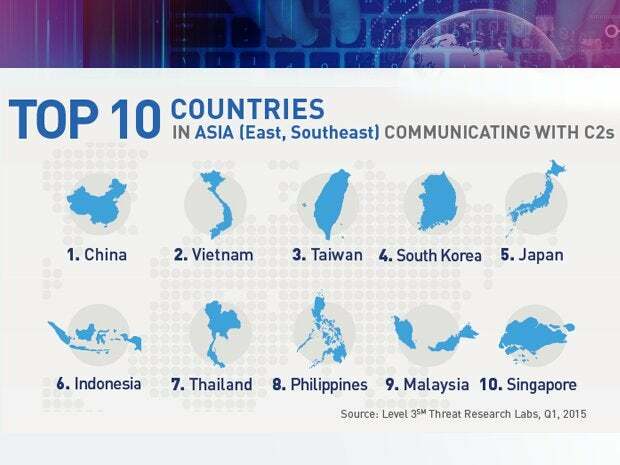 1 targeted country in East/Southeast Asia was China, followed by: Vietnam, Taiwan, South Korea, Japan, Indonesia, Thailand, Philippines, Malaysia, and Singapore.